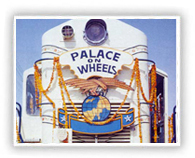 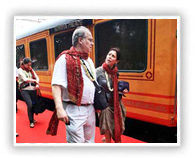 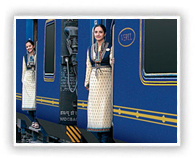 The Maharajas train comes with 5 pan-India itineraries, each offering a peek into a unique aspect of the Kaleidoscope that is India. 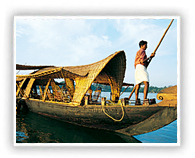 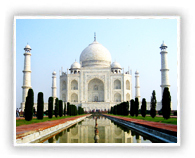 The itineraries which are referred to as the Indian Panorama, Heritage of India, Indian Splendor, Treasures of India and Gems of India, traverse across mesmerizing landscapes, some of the most alluring destinations and illumine the eclectic mélange of intricate tapestry connecting this incredible country, the true essence of India. 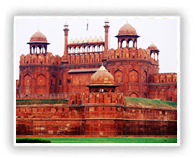 Come discover the romance of incredible India, as you explore the lands of Maharajas, the mighty fortresses and exquisite palaces, the tales of valor and chivalry, and as you roam the private hunting ground of former maharajas which are now occupied by tigers; the kings of jungle. 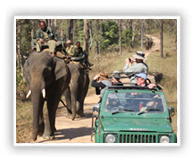 Discover the mystic of India as you partake in evening Aarti ritual at bathing Ghats of Ganges, as you witness the local artists performing at sun downer cocktails among the undulating sand dunes or experience royalty as an audience or participant of Elephant Polo Match. 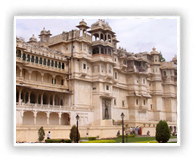 Places to See : Mumbai - Sindhudurg - Goa - Kolhapur – Aurangabad(Ellora) - Chandrapur (Tadoba Wildlife Sancturary) - Wardha (Sevagram)- Jalgaon(Ajanta) - Nashik and Mumbai. 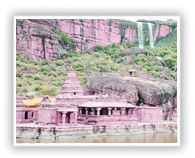 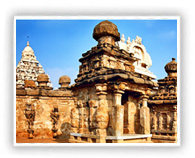 Places to See : Bangalore - Kabini/Bandipur - Mysore - Hassan - Hampi - Gadag - Goa - Bangalore.